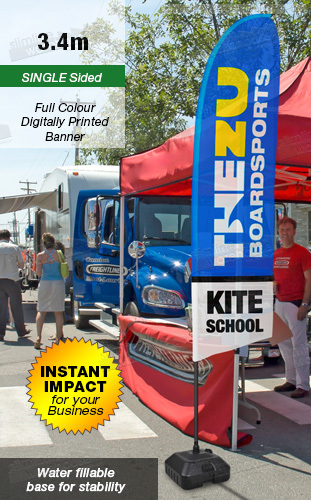 Feather flags, also known as flutter banner signs, are made from woven polyester to provide a durable flag that will last for years to come. Digital printing is used to create a vivid full colour display that has a true depiction of your custom designs that will get the attention of passersby. A reverse print on the back effectively turns this display into a dual-sided stand, maximising space and reaching more customers. 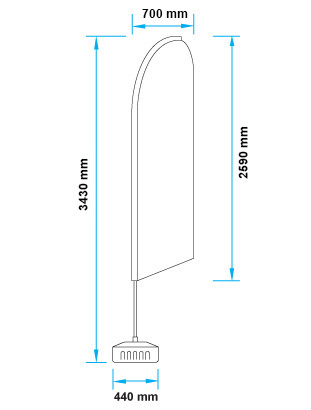 These feather flags have a fillable base that helps provide a stable display for use in different winds and weather. Fill the base with water or sand to weigh it down. 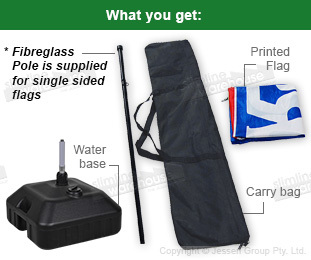 The advertising feather banners are portable, with a built-in handle in the base to make carrying it easier. 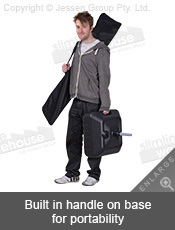 A nylon carrying bag is included as well that also helps to protect the flutter sign in between uses. 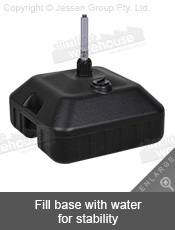 Assembly is quick and easy due to the collapsible fibreglass pole not requiring any tools for set-up! There are hundreds of products available now for you to purchase in our online catalogue, with the wide variety of options encompassing many categories to ensure you can find the right product for use at your location. With over 20 years in the business, Slimline Warehouse has become a national leader due to our low prices on high-quality items. Despatch is provided same day from our warehouse with most in stock items that are purchased by 1pm EST. Order for your home or business today in Adelaide, Brisbane, Perth, Melbourne, Sydney, Bendigo, Newcastle, Darwin, Hobart, & anywhere else in Australia!